It can take several months for a truck driver to complete the required classes in order to receive a Class-A Commercial Driver’s License (CDL) in Washington State. In that time, drivers receive hands-on instruction and training about the many technical maneuvers that are required to safely operate a semi-truck or other type of large commercial vehicle. A qualified and experienced trucker knows that patience and caution are the two most important qualities of a safe driver, and all drivers must prioritize these two qualities when it comes to turning and performing other maneuvers behind the wheel of a semi-truck so that other drivers are not forced to stop or make other last-second decisions to avoid a crash. When an injured victim calls my office about a potential truck accident case, I immediately begin investigating to see if any common mistakes might have caused the accident. While the list of potential mistakes made by any driver is never-ending, below is a list of just some of the most common mistakes made by truck drivers that we see in semi-truck accident cases. Backing Up. Large truck drivers often have to back up in order to make delivery to a loading dock or other unloading point. These situations frequently lead to pedestrian accidents, especially if the truck driver failed to follow proper protocol such as activating the back-up beeper. Distracted Driving. It is illegal for anyone to use a cell phone or engage in other distracting behavior while operating a motor vehicle, and commercial vehicles are no exception. In fact, punishment for distracted driving can be even more severe for truck drivers. Driver Fatigue. Commercial vehicle operators have an incentive to complete their work in as little time as possible. This means drivers will sometimes sacrifice sleep in order to work, either on their own or at the direction of a manager or supervisor. This is a serious violation of federal regulations and jeopardizes the public's safety. Drunk Driving. Driving while under the influence of alcohol is one of the biggest risk factors associated with increased risk of a car accident. While it is undoubtedly a problem among drivers of passenger vehicles, thousands of semi-truck accidents involve an intoxicated truck driver each year in the United States. Drugged Driving. Drug impairment, like alcohol impairment, is another serious safety issue that jeopardizes the health of everyone on the road. Trucking companies will typically prohibit drivers from using any form of intoxicating drugs, but that is not always a perfect deterrent. Speeding. Traveling above the speed limit is very dangerous for a semi-truck because it takes a long time for those large vehicles to come to a controlled stop. 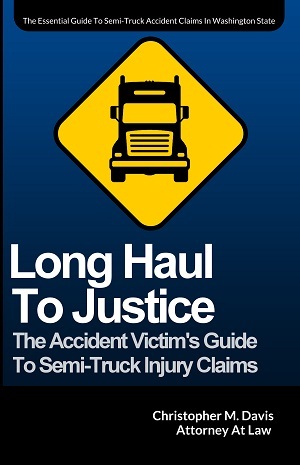 A speeding semi-truck which rear-ends a passenger can cause serious injuries or even death. Unsecured Loads. Trucks are legally required to secure their loads and ensure that they do not litter the roadways with debris. If a semi-truck's lost load causes a crash, the driver and the trucking company could be held legally responsible for any injuries or other damages that result from that collision. Blind Spots. Visibility is difficult for semi-truck drivers, and it is important that they do everything within their power to check blind spots before making turns. A thorough investigation into your semi-truck accident case can help determine if a truck driver may have missed a blind spot when making a turn. Maintenance Issues. Federal laws require trucking companies to ensure their vehicles are in proper shape when on the roadway. If a trucking company fails to maintain a vehicle that is later involved in a collision, the trucking company can be held liable for negligence. Improper Turns. Most turns and maneuvers are more difficult for semi-trucks than regular passenger vehicles, and therefore truck drivers must understand how to strategically make those turns in order to avoid a collision. Sometimes truck drivers make mistakes in these situations, and innocent motorists can be injured as a result. Traveling Too Fast For Conditions. Semi-trucks need to be even more sensitive to driving in difficult weather conditions because they are already much more difficult to control or stop at high speeds. Inclement weather only increases these difficulties, and it is not uncommon for a trucker to be cited for driving too fast for road & weather conditions. Parking Illegally. 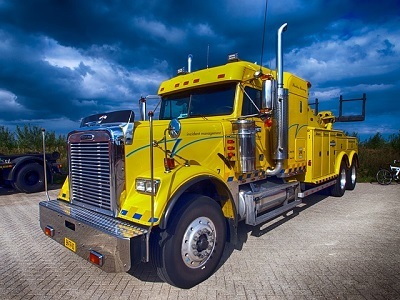 If a truck suffers a mechanical problem or has to pull over to the side of a roadway or highway for any reason, there are several precautionary steps that need to be taken in order to ensure the truck is visible to other drivers. Failure to follow these laws can result in a serious or fatal accident, and state law allows victims to hold truck drivers and trucking companies responsible for negligence. Underriding. A vehicle that collides with the side of the cab or trailer of a semi-truck is at risk of “underriding” the truck. This means that a vehicle can become wedged between the bottom of the trailer and the ground. Today, most semi-trucks are legally required to have underride guards – designed to greatly reduce the damage done by these types of crashes – built into the rear end of the semi-truck. Victims who have been injured due to a negligent truck driver have the legal right to pursue a personal injury claim against the at-fault driver who caused the accident, as well as any other possible defendants who may be legally responsible. Identifying all of the potential responsible parties in a commercial vehicle accident case can be very complex and may require the legal expertise of an experienced semi-truck accident lawyer. The truck accident attorneys at Davis Law Group have helped victims of serious commercial vehicle collisions for more than 20 years. Call our office in Seattle at (206) 727-4000 or use the confidential contact form on this page to have your case personally reviewed by our award-winning legal team. If we believe we can help you with your case, our attorneys will meet with you for a free legal consultation.